Teenager Ruby Baker is out on the town and past her curfew. As she says goodbye to her friend and explains that she is going to be in trouble again for being late she hurriedly leaves. While this is going on, her parents are in a car crash and both of them die. She arrives home to find two policemen in her home. When they try to tell her about her parents, she faints. The beginning of this film leaps into action. Before the first reel has been changed over by the projectionist, Ruby and her younger brother Rhett have been orphaned and now must live with their old neighbours acting as their guardians. The ‘best friends’ have moved to a huge glass house in an exclusive area. This will be their new home. Once the two children move into the glass mansion, things start getting strange and it seems the ‘old friends’ have changed from the nice people that used to live next door. 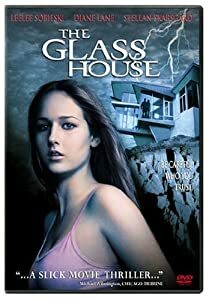 While not anywhere near blockbuster territory, The Glass House delivers very well. For a start Tom Hanks‘s missus Rita Wilson is in an uncredited cameo that must surely classify as the smallest in the world. Ms Wilson plays Ruby and Rhett’s mother and dies roughly about ten minutes into the film with her husband Michael O’Keefe the other candidate for the worlds smallest cameo award. Both Wilson and O’Keefe are seen later in the film when their daughter Ruby visualises their death, over and over. Ruby is played by the very capable Leelee Sobieski a young actress that make me think of a young Helen Hunt. With two awards under her belt and quite a few more nominations this young lady is not lightweight. She had no trouble convincing me that her character was grieving, confused, and finally suspicious about this couple that she and her brother were wards of. When she takes action, it does not jar or stretch belief. The Glass couple that take over as the children’s guardians are played by Diane Lane and Stellan Skarsgård. My only complaint about the film has to do with the fact that I felt that Ms Lane was not used enough. That is most likely my problem only as I have been a huge fan of this talented lady’s work for years. Stellan Skarsgård does a great job as the devious and slight scary Mr Glass. Glass, it seems, can only afford the grand lifestyle he and his wife have by less than legal means. The nicest thing about the film was seeing Bruce Dern as Ruby’s family lawyer. Dern has been acting since grass was green it seems and the old boy has still got the chops. Although it was a change to see him playing a ‘normal’ good guy part instead of the usual eccentric parts he is famous for. All in all a film worth watching. Released in 2001 it is recent enough that it doesn’t suffer from being too outdated. Add the fact that the film is easily available via Netflix and other streaming film sites, it won’t cost you the earth to give it a look. Previous Previous post: Cameras in Your Home, Could You?